I really enjoyed the original Aladdin movie, for a variety of reasons. It had a compelling story, characters that we cared about, beautiful artwork, and compelling songs. 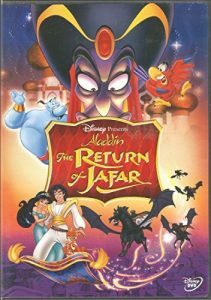 It’s sad to say that the sequel, The Return of Jafar, is pretty much the polar opposite. The artwork is bland, and the entire movie looks like four episodes of the Aladdin television series stitched together. Which is pretty much what happened. Robin Williams does not voice the Genie, and it clearly shows. Several of the characters act out of character. Remember how Jasmine was a strong, independent woman? That’s gone. Remember the various memorable songs from the original Aladdin? None of the songs from The Return of Jafar are very memorable. And what truly saddens me is how this film treats the villain, Jafar. He was one of the great Disney villains, and this film treats him poorly. In summary, I really enjoyed Aladdin, and I really disliked The Return of Jafar. The good news is, things get better in the final film in the series, Aladdin and The King of Thieves.